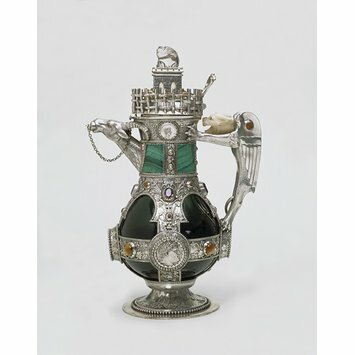 The architect and designer William Burges (1827-1881) designed several decanters (decorative vessels for serving wine at the table) similar to this one. These included two for use in his own home, Tower House in Kensington, London, as shown in contemporary photographs. Burges looked to the arts of China, Assyria, ancient Greece and Rome, and medieval Europe as inspiration for this design. This decanter was made to accompany a drinking cup which the merchant James Nicholson had ordered in 1863. The cup is now on display in the Silver Galleries of the V&A. The decanter was ordered by Nicholson through Richard A. Green, whose firm appears to have been largely concerned with the manufacture of jewellery. Green did not make the decanter, though he probably supplied the expensive and unusual decorative embellishments, such as the hardstones, ancient Greek and Roman coins, and the large, rare piece of mother-of-pearl which forms the lion's head on the handle. The maker was the silversmith Josiah Mendelson. A surviving bill indicates that Green was paid £48 6s 8d for the decanter, and a further 8s 6d for a case. 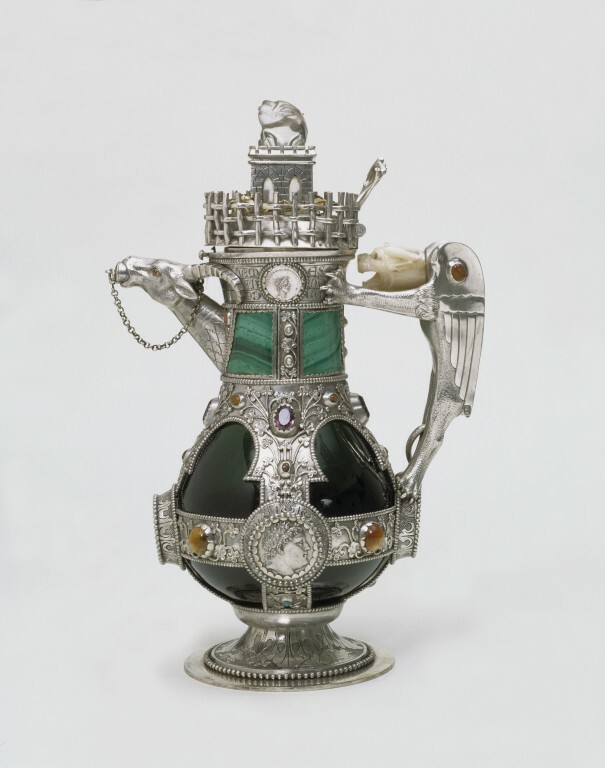 Decanter, glass bottle, mounted in silver, parcel-gilt set with rock crystal, malachite, mother-of-pearl, semiprecious stones, intaglios, and coins, 27.9 x 19 x 13.5 cm. London date hallmarks; inscribed "JAMES NICHOLSON ANNO DOMINI MDCCCLXV". Decanter designed by William Burges, glass bottle with silver-gilt mounts, London,1865-1866.